Scott Walker's rivals see him as an up-and-comer in the Republican race for president, so they are focusing on the Wisconsin governor's changing positions on a number of issues. Up-and-comer in the Republican race for president Scott Walker will be in New Hampshire this weekend, following scrutiny from GOP rivals that the Wisconsin governor has changed his stance on a number of issues. The still-unofficial campaigns of several Republicans have assembled internal memos, research papers and detailed spreadsheets that highlight and track Walker's shifts on positions from immigration to ethanol to abortion. They say Walker has a broad pattern of flip-flopping that will be his greatest vulnerability. The rush of what's known in the campaign trade as "opposition research" comes as Walker is in midst of a swing through two early voting states. He travels next week to South Carolina after spending this weekend in New Hampshire. Steve Duprey, a Republican national committeeman from New Hampshire who is not aligned with any candidate, said Walker is relatively unknown among voters in his state - meaning the governor is subject to definition by his opponents. "You have to be an authentic candidate," Duprey said. "If people think you're flipping left and right, that sticks with you." Walker has earned strong reviews for his early performances in Iowa and at several forums attended by other expected Republican presidential candidates. Former Minnesota Gov. Tim Pawlenty, who ran for president in 2012, said Friday that Walker and former Florida Gov. Jeb Bush are the leading candidates for the Republican nomination. "Scott is from a Midwestern state, but he has a national profile and a national fundraising capability," Pawlenty said. "The non-Jeb money is increasingly flowing to him, and he's used to communicating red messages in blue places." In the past week, aides working for other Republicans expected to run in 2016 have circulated materials that highlight Walker's change in position on immigration, ethanol mandates, Common Core education standards, abortion and right-to-work legislation. One campaign has a spreadsheet that outlines when Walker changed a position in comparison to 2012 GOP nominee Mitt Romney. The analysis found that Walker's shifts on more than a dozen issues came an average of 15 months before the Iowa caucuses - almost a year later than did Romney's. "Voters still don't know the real Scott Walker," said veteran Republican operative John Feehery, who is not aligned with any of the potential candidates. "And if he thinks he can get them to like him merely by saying things that they want to hear, he is going to run into the same problem that plagued Mitt Romney: authenticity." AshLee Strong, spokeswoman for Walker's campaign-in-waiting, said each issue needs to be examined in detail to better understand his positions. "Gov. Walker has a proven record of championing big, bold reforms in Wisconsin to limit the government and empower people," Strong said. "It's lazy and inaccurate to simply lump all issues into one narrative instead of actually examining the facts." 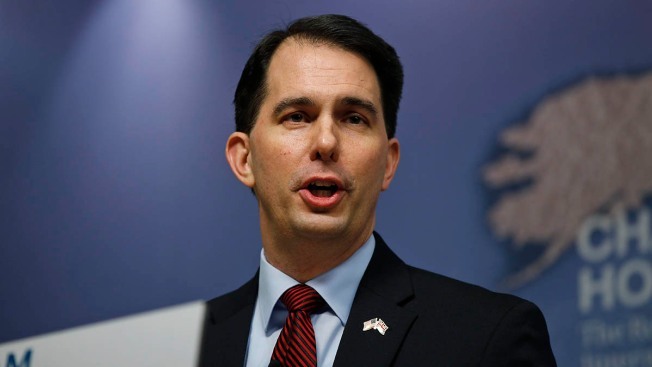 Walker has acknowledged changing his some positions, most notably on immigration. As early as 2002, he publicly supported creating a pathway to citizenship for immigrants living in the country illegally. In an interview with Fox News this month, Walker said he no longer supports what he termed "amnesty." He defended his shift in view, saying he had done so after talking to governors of border states and voters nationwide. "My view has changed. I'm flat out saying it," he said. "Candidates can say that. Sometimes they don't." In the heat of his re-election campaign last year, Walker softened his position on abortion, saying in a television ad that the decision on whether to have an abortion is between "a woman and her doctor." This month, after drawing criticism from conservatives, Walker said he would sign a bill banning abortions after 20 weeks of pregnancy. As a candidate for governor in 2006, Walker was critical of the requirement that gasoline contain a certain amount of corn-based ethanol. "Mandates hurt Wisconsin's working families," he said at the time. "And whether they are from Washington or Madison, we as fiscal conservatives should oppose them." Speaking at an agriculture summit in Iowa last week, Walker said the fuel standard that requires the use of ethanol is "something he's willing to move forward on." Walker's first budget as governor supported the Common Core academic standards in 2011, but he called for their repeal last summer. During his recent re-election campaign and in the months that followed, Walker said an effort to pass right-to-work legislation in Wisconsin would be a distraction and he urged lawmakers not to address it. Last week, after the Wisconsin Legislature did so, he signed the bill into law. A former Republican National Committee chairman, Michael Steele, said he has heard from other Republicans about Walker's shifts on policy positions. Steele said it is a matter that will play in the presidential primaries. "If you've taken positions and done things, you've got to stay true to that. You cannot reframe it for a presidential race," Steele said. "Everyone's trying to find a way to carve these men and women up before they even get out of the gate."